During a wool stash sort thorough I found a few more UFOs that I had started and then forgotten about. First off would be these little Koala booties (designed by crochetroo). These are the first pair that I made from this pattern, but they ended up at the bottom of my stash due to being too small for the intended recipient. They are light lilac with light blue koalas on the front and they measure 9cm by 4.5cm. If you have a little one that they would fit then leave me a comment (with your email address) to let me know. 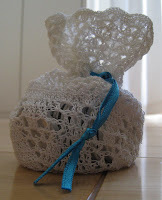 Next up is a little crochet thread bag - made from the same lovely book as my crochet stars. Another very early project, it has a simple round bottom with a petal design and then a lacy body through which you can thread a bit of ribbon to act as a drawstring. This bag does not come with the tasty chocolate money that is shown in the photo as I have every intention of eating it all... however, if you would like the bag (sans chocolate) then again just leave a comment with an email address so that I can contact you. Love those booties and bag! I'll take the bag, no more babies in my future, so we'll let the booties to go to someone else!